We are excited to announce that Morris & Garritano was recently honored with not one, but two industry awards. Click on the publication covers below to read the full articles. 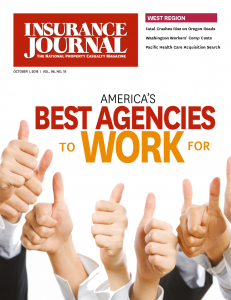 For the second year in a row, M&G was named one of Insurance Journal’s ‘Best Agencies to Work For.’ It is a true testament to the spirit of our employees that we have been able to maintain our culture while bringing in new team members and growing as an agency. This award was based on our own employees’ nominations and responses to Insurance Journal’s anonymous survey about work-life balance, competitive wages and growth opportunities, community involvement, and overall job satisfaction. 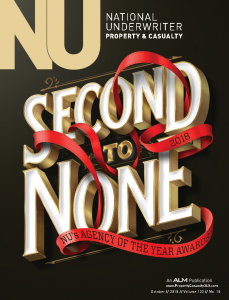 Alternatively, from a client services perspective, we were recognized as one of three recipients in the nation for National Underwriter’s ‘Agency of the Year’. This award is based on an evaluation of our client services, claims-handling, employment of new technologies, agency marketing, and customer retention. Thank you to our amazing employees, colleagues, and clients for trusting us to serve you and provide you with peace of mind throughout the years and for generations to come. We love what we do, and we love that we get to do it for all of YOU!